The Muffin Knight game is addictive and visually appealing on the iPhone. 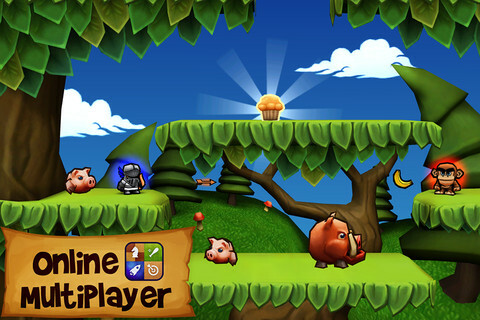 Muffin Knight, a new application for your iPhone, iPod touch , or iPad , from Angry Mob Games challenges your inner muffin-lover to capture muffins and save them from various villains, while your character transforms into different heros with various skill levels and abilities. As you progress through the levels, you can unlock new characters and improve the abilities of each hero. Muffin Knight is an iPhone app at its best: simple, addictive, but not easily mastered. It’s easy to figure out the basic rules, without having to read through screens of explanations. The concept is simple, but as you play, you realize there are nuances that can improve your performance. A quick round while you’re on a train or in a waiting room will pass the time, but you can also find yourself lost for hours battling pigs, skeletons, and other fire-agitated creatures. For $0.99 for the full version or the free version, you can’t beat the value for hours of entertainment. The gameplay is real-time with no annoying loading delays. The controls take a few minutes to master, as you must use arrow keys and jump and shoot buttons. Since they are more button-based than other apps, they are reminiscent of old-school Nintendo or Sega games. Coupled with the visuals, the effect of the gameplay is an old-school ambience. Thus, even more traditional gamers with a few spare minutes would enjoy playing this game . A suggested improvement for this iPhone app would be an expanded help screen or a tutorial option for first-time players. The app is quite enjoyable without it, but a reference would ease the learning curve. More information about each character and its abilities, other than just when you unlock each one the first time, would also help. I could never remember which character had what ability and it got my hero killed on more than one occasion. After playing for several hours, I’m still unsure of all of the strategies to success. Overall, Muffin Knight is a great app that I will continue turning to for many hours entertainment. 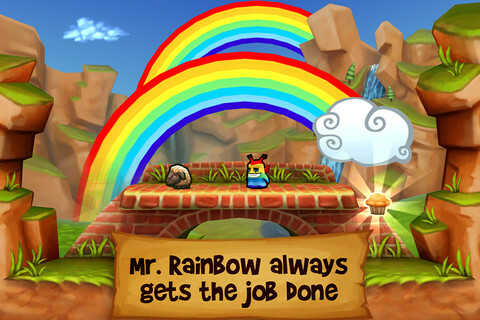 AppSafari review of Muffin Knight was written by Joe Seifi on October 27th, 2011 and categorized under Action, App Store, Arcade, Games, Platformer. Page viewed 3952 times, 2 so far today. Need help on using these apps? Please read the Help Page.